Bengaluru, Oct 28 (IANS) Prime Minister Narendra Modi will be on a day-long visit to Karnataka on Sunday for participating in various functions in Ujire, Bengaluru and Bidar, said an official on Saturday. The Prime Minister will also launch the digitised cashless Self-Help Groups (SHG) transactions in the state Charitable trust of the Sree Kshetra Dharmastala Rural Development project is organising the public function and the launch of the Rupay cards and SHG transactions at the rally. 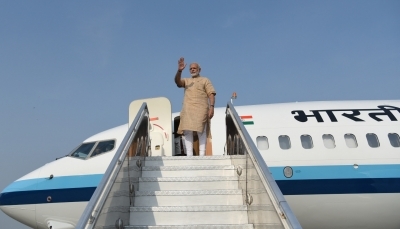 Post-launch, Modi will fly to Bengaluru to attend a public function organised by the Vedanta Bharati at the Palace grounds in the city centre. Later, Modi will dedicate the 110km Bidar-Kalaburgi railway track in the Hyderabad-Karnataka region that would reduce distance between Bengaluru and New Delhi by 380km and travel time by six to eight hours. Though foundation for the project was laid over two decades ago in 1996, its construction work began only in 2000 and dragged on for years due to meagre fund allocation by the Railway Ministry. Next: Did RBI have authority to issue Rs 2,000 and Rs 200 currency notes?